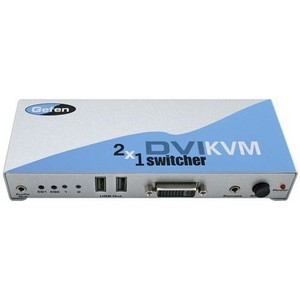 The Gefen 2x1 DVI KVM Switcher easily and reliably switches between any combination of two DVI and USB 2.0 equipped computers (PC or Mac) - using only one keyboard, monitor, and a mouse. It saves space - there is no need to work on a desk crowded with double monitors, keyboards, and mouse devices. It saves time - there is no need to move from one monitor to another to access different computers. It also saves money - there is no need to purchase additional monitors, mouse devices, and keyboards. The 2x1 DVI KVM Switcher allows you to choose between a PC or Mac keyboard/video/mouse combination.